ESPN’s Sunday Night Baseball Ratings Up Double-Digits in 2017 - ESPN Press Room U.S.
Ratings for ESPN’s Sunday Night Baseball presented by Taco Bell franchise – home of the exclusive, national MLB game of the week – increased by 10 percent in 2017, compared to last year, according to Nielsen. Sunday Night Baseball averaged a 1.1 U.S. household rating across 26 telecasts, up from a 1.0 rating in 2016. Additionally, Sunday Night Baseball’s total live audience – p2+ viewership plus streaming – was up eight percent, averaging 1,762,000 viewers, compared to 1,625,000 viewers in 2016. 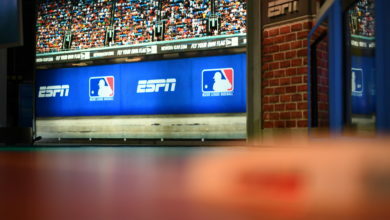 ESPN also saw ratings growth for Sunday Night Baseball in multiple demos, including P18-34 (0.4 vs. 0.3), P18-49 (0.5 vs. 0.4) and M25-54 (0.8 vs. 0.7). On deck: the 2017 American League Wild Card Game will air exclusively on ESPN, Tuesday, October 3, at 8 p.m. ET.